As part of the NV Energy Assets surveys and site evaluations on the Tahoe National Forest in 2011, Far Western recorded a possible historic grave site on the Overland Emigrant Trail near Truckee. At the request of Forest Service Heritage Program Manager Carrie Smith, we contacted the non-profit Institute for Canine Forensics (ICF) to investigate. The ICF has worked on many archaeological sites, including the Donner Camp, a WWII aircraft crash in Goose Lake, Oregon, and graves under the chapel floor of the Santa Barbara Presidio. Currently they are in the South Pacific on an expedition sponsored by the National Geographic Society to look for remains of Amelia Earhart and her navigator, missing since 1937. On June 6, 2017, three ICF dogs and their handlers met with Sharon Waechter and Vickie Clay to “sniff out” the possible emigrant grave. The ICF dogs are trained in Historic Human Remains Detection (HHRD), and can differentiate between human and non-human (animal) remains. The dogs and their handlers use a search strategy designed to fit the specific terrain and conditions. For our project, the handlers allowed the dogs to “wander” freely, making zig-zag transects across the small meadow where we had recorded the possible grave. All three of the Border Collies stopped briefly to investigate the stone pile before continuing on. 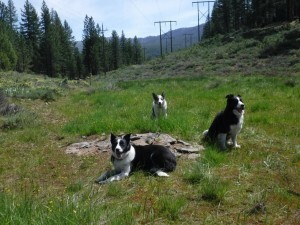 In each case, they returned several times to the stone pile, and eventually all three dogs “alerted” on the pile by sitting or lying next to it. The grave was confirmed!